Another stop we made along our way was to the former site of the World War II-era Japanese Internment Camp of Manzanar. If you're not aware from 1942 to 1945, the United States created a Japanese exclusion zone that covered all of California, the western half of Washington and Oregon and a southern section of Arizona. What it meant was that if you were a Japanese citizen or someone with Japanese parents and you were living on the Pacific coast, you were confined in a camp for the duration of the war. There were a number of odd things about this situation. For starters, Hawaii (which wasn't a state at the time) had more Japanese-Americans than any other American territory, but less than 1% of that population was sent to camps, whereas the entire Japanese population of California was relocated. Furthermore, Japanese living in 44 other states not in the exclusion zone were for the most part not interred at all. 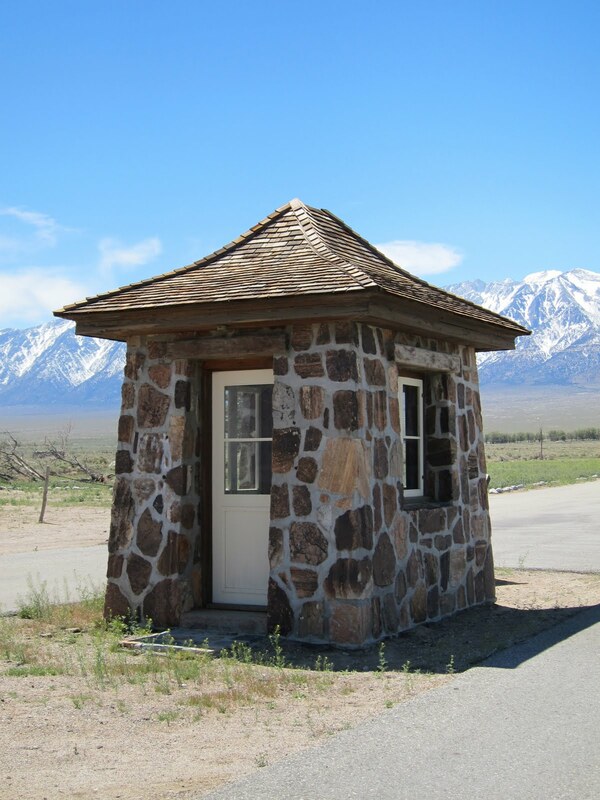 At its peak, Manzanar was home to about 10,000 people. While the conditions at the camp were not ideal, they did manage to build gardens, farms, work at jobs, go to school, church, and enjoy recreational activities. One of the interesting things to me is how the camp is being rebuilt. Only three original buildings remained, two small stone police buildings, and the auditorium which had been used as a VFW Hall by the local community after 1945. The auditorium is now the visitor center and a museum. They've now rebuilt about three of the housing barracks and a one of the eight guard towers. It appeared that they might eventually rebuild more of the barracks, but they actually seemed all the same, so I don't know if they're going to do that or not, they'd have 501 more to build get to the original size. There was a model in the visitors center and that gave a better idea of the size of the camp. Another thing that was kind of interesting is that the recreated barracks had rather large wheelchair ramps built onto the outside of the barracks. Being one for historical realism, I couldn't figure out if I liked that they were allowing more people the ability to see the inside of the barracks or if it detracted from the scene. It wasn't just the wheelchair ramps, the fire sprinklers and lighted exit signs also seemed out of place to me. It almost made it them seem a little touristy. I thought the most fitting memorial was the commemorative obelisk at the cemetery. It was very beautiful with the Sierra Mountains in the background and very peaceful. You may recall, I mentioned that I have a friend Mark Nakamura. In the visitor center, there was a display with a suitcase with the Nakamura name on it. When I got home, Mark told me that Nakamura is a fairly common Japanese name and that his family was living in Utah during the war, so they weren't relocated. One other curious item. The name Manzanar means "apple orchard." Years before there was a camp, there was a town that existed in this place that was rather well watered. Over time, the city of Los Angeles bought up the water rights and diverted the water down to LA. 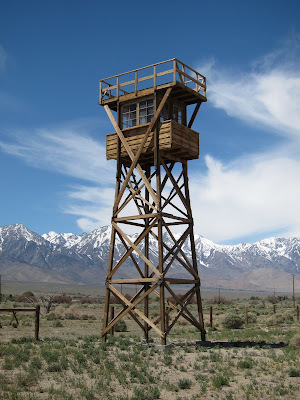 In time, there wasn't enough water for farming and people left, but since there was a somewhat abandoned settlement, the War Department leased Manzanar from Los Angeles. You learn something new all the time! I love the stone sentry post huts. Reminds me of the work the CCCs did, which I admire wherever I find it. 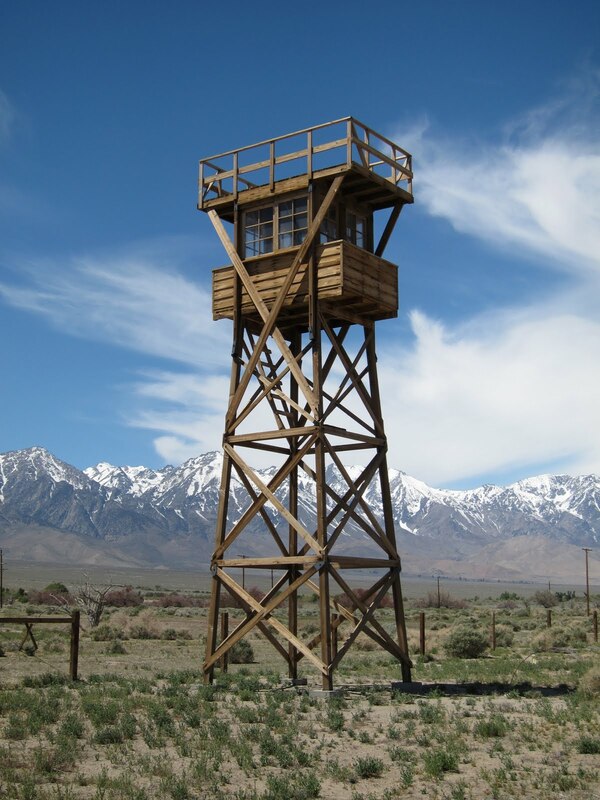 We had an internment camp (Heart Mountain)in Wyo - COLD! Thanks for an interesting lesson. My friend Kazu is on a short work related visit to California. I must remember to show her all this when she returns. Thanks, Nate.